According to eMarketer, 67% of Millennials and 50% of Generation X US internet users shop in bed. While it is old news that shopping has gone beyond brick and mortar stores and into our homes via digital devices, online retailers who optimize for mobile devices and user experience are thriving in the crowded world of e-commerce. For e-tailers looking to make their sites both mobile optimized and user-friendly, there is a simple solution – site search technology. Technology that improves a website’s search function is an effective way for online retailers to quickly give prospective customers what they want. Many fast-growing e-tailers have one thing in common – they allow online shoppers to find exactly what they are looking for through advanced search. They do this because they understand that fast product discovery is pivotal to driving online sales. Baymard Institute reports that a poor search interface typically leads to more abandonments and users are unlikely to return to the site. Audiences searching your online store have intent to buy, so why not make it easier for them? Online shoppers do not want to spend more than a minute hunting down a search bar, which is why e-tailers can add value to their website with a prominent search bar and a well-designed search tool. An effective search product will recommend products through a drop-down menu to help visitors save time. In addition, intuitive search tools that offer autocomplete, spell check, and synonym matching can guide customers to the right item when the product name is on the tip of their tongue. Site search technology is a simple way to improve the function and UX design of any online store, and ultimately a user’s shopping experience. No matter the scale of your online store, you can still engage visitors who discover your site and turn them into loyal customers. Maybe you are thinking that you are a small e-tailer and there is no immediate reason to give your visitors intelligent search with your limited supply of products. If that is the case, then do not underestimate how site search technology can be beneficial to both the customer and business owner. Many site search products, like SearchIQ, offer analytics as a primary feature to help online stores grow their business with data. You can think of site search analytics as your business intelligence team, giving actionable insight to fuel business growth! Analytics enables e-tailers to view the products or keywords their users search for, allowing them to discover the types of products consumers express interest in. E-tailers can use this valuable information to source products their customers want. For example, if you own an online home store and you use site search technology to learn that a large number of your visitors are searching for candles, then it would benefit your business to add candles to your store catalog. You can increase your conversion rate by appealing to your candle-loving customers. The ultimate goal for any store, online or not, is to get products off the shelf. Site search technology offers the ability to arrange product information in a search results drop-down menu via custom results ranking. This feature gives you the power to recommend specific items to your visitors who have the most intent on converting. You can give special attention to new items or products that have not had much love from customers and move them to the top of your search results list. Site search technology allows you to be strategic in how you showcase products to your customers. Maybe you have an online store, and you are trying to sell the rest of your holiday-themed inventory. When a visitor searches for table linens, you can customize results to bring holiday tableware to the top of the search results list. In addition to helping visitors save time when looking for products, site search technology also increases the length of time visitors spend on site. Econsultancy states, “A better user experience means that customers are more likely to spend more time on the site, and can boost the number of registrations and return visits.” Potential customers are more engaged to browse available inventory with efficient site search, leading to an increase in online sales. SaaS services have helped raise the bar for what we enjoy and now expect from the apps and sites we use every day. By leveraging specialized, managed services, delivering world-class experiences is easier than ever. Moreover, these SaaS services’ innovations enable features and functionality that were otherwise inaccessible to all but the behemoths such as Google and Amazon. One such feature businesses can now take advantage of is Search Analytics, specifically on-site search analytics. Not to be mistaken for search engine analytics that track aggregate search activity on search engines such as Google, search analytics, in this case, refers to the analysis of search behavior on your own site. At SearchIQ, our search analytics service empowers our customers with real-time access to a treasure-trove of insights. With our search analytics platform, we stay true to our mission of making advanced technology easy to use. We designed our search analytics platform to be both intuitive and powerful so that our customers have easy access to actionable information. To help illustrate just how search analytics can improve your business we can look at a few examples. 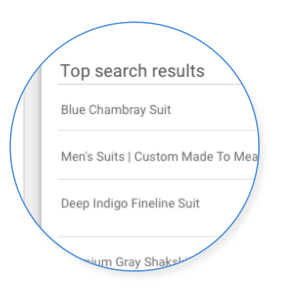 A suit manufacturer can predict trends in colors by analyzing search requests irrespective of what the current store offers. Unsurprisingly, blue is a popular color. Dig a little deeper, and it is clear that lighter colors including lighter shades of blue are more sought after than Black or Navy; the latter not even being amongst the top 5 search terms. Successful forecasting of product characteristics like color can easily lead to numerous benefits. This includes efficiently meeting demand, maximizing profits, reduction of overages and the subsequent need for inventory liquidation that can hurt the brand. Even with insight into your customers’ wants and intentions, it can be difficult to predict exactly how users will search for your products and services. Footsmart.com was able to improve their conversion rate for site searches by 82%, by enacting a weekly monitoring campaign of underperforming search terms and adjusting the results accordingly. There are many complementary techniques to optimize your results at your disposal. By reviewing search queries that did not lead to results you can tailor the descriptions and tags of substitute products and services to include their keywords used in the failed searches. 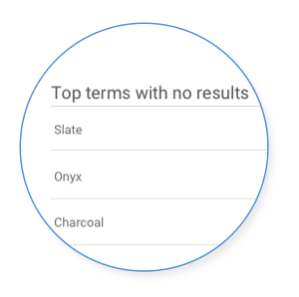 With tools like synonym mapping (available with SearchIQ), you can map terms such as “slate” to results with similar colors such as “gray” and “azure”. 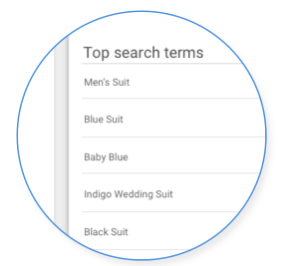 If you find that users are using multiple keywords to search your products and services, a broad match filter can be a better option over phrase matching. Search analytics can identify both problems and opportunities in the UX, including your content and navigation strategy. In reviewing the top search results, you can better understand what users had to search for, ergo, what wasn’t easily accessible in your site’s navigation or content presentation. Simply featuring your site’s most sought-after content on the homepage can lead to a dramatic increase in conversions. Moreover, it is considered best practice to actually showcase what lies beyond the homepage. The discovery of category or other high-level pages in search results is an indicator that your site’s navigation is either poorly structured or categorized. As a general rule, search is best used for helping users quickly and easily finding specific pages and should not be a replacement for good navigation. Fortunately, SearchIQ can provide the data needed to inform your UX optimization decisions. In summary, Search Analytics is an often under-utilized, yet highly valuable resource that captures and exposes your users intent, can drive product and service planning, help hone your product merchandising and enable data-driven UX improvements. SearchIQ includes its analytics suite with all accounts, making the power of on-site search analytics and the business intelligence it provides access to stakeholders across your organization. It’s official; Google is discontinuing Google Site Search. It seems everywhere we look we can’t help but see GSS (Google Site Search) or CSE (Custom Search Engine) being written about in different posts and articles. It can all be quite confusing if you use either of these products. So we decided to shed some light on what this means, what you should be looking for in an alternative and how to get new search up and running properly. Let’s start off by explaining the difference between the two. GSS is a paid product to implement Google’s search technology on your website, while CSE or Custom Search Engine is a free, ad-supported site search engine. And although everything seems great because Google is directing existing customers to use their free custom search engine as a replacement, unfortunately using CSE will force the websites to show ads along with their search results. Is Google custom search a good alternative to GSS? How does Google custom search impact your website’s search experience? How does it affect the overall user experience? As you know, Google CSE is an ad-based site search engine which means that your website will be exposed to ads that you may not want. A user performing a search on your site is looking for something specific and displaying ads along with search results could disappoint or confuse the user, driving them to leave your site. To go even further, worst case scenario could be your website displaying ads from competitors, leaving you at the mercy of their paid advertising. When and if the user clicks on an ad, they will be redirected to your competitor’s website and you will lose a potential customer. Apart from the ads, CSE has a daily capping limit for search queries. This means that if your website has high search volume, it will stop working once you’ve reached the limit. Another point to consider with Google custom search is that there isn’t any email or phone support. If you have a question or query, you pretty much have to figure it out on your own. Good site search is designed to help visitors find the desired content or products they’re looking for, and not to distract users making the search complicated. The relevant search results (advertisement free) enhance user engagement on your website and drive more conversions. An effective site search has a business goal to generate more revenue, more traffic, or longer visit times. So compromising the user experience by displaying ads could completely alter your business strategy. Considering the details mentioned above, migrating to CSE may not be an ideal solution for your website. Why SearchIQ should be your next search solution? SearchIQ is a unique and modern search engine technology that offers enhanced search capabilities and gives your visitors the best user experience. It is the most advanced and robust alternative for Google site search. We at SearchIQ understand that your users rely on search and we get that search is crucial to drive business and increase viewership, that’s why we designed our powerful algorithm to return fast and accurate search results quickly. We also help you manage content more effectively with real-time analytics. 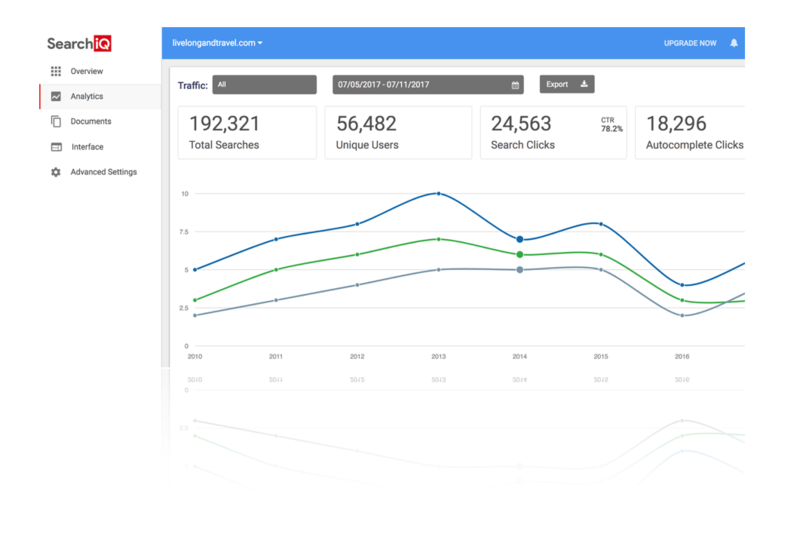 Via our dashboard of analytics you can see what is most searched (that you may or may not provide results for) allowing you to create content based on what people want. As a site admin, you must be curious how SearchIQ is different from other SaaS search solutions? Let’s look at the features to understand the difference and benefits to using SearchIQ. You can easily configure and manage your domain through the SearchIQ dashboard, just a few clicks and your search engine is ready. Easily create an account to add your domain and index your website. In our resources section we provide step-by-step instructions on how to implement any feature or assistance with customization. SearchIQ features various customization options to match your website’s theme and look. Apart from the general options, you can further change the feel of your website using our ‘Custom CSS’ option. SearchIQ’s architecture is robust and completely scalable, so you don’t have to worry if any of your domains experience more traffic than usual. As your data or query volume observes a spike or surge, SearchIQ will scale your domain’s resources up or down as needed. SearchIQ is much more cost-effective compared to other SaaS solutions. If your website meets the criteria for number of posts, pages or products SearchIQ is totally free. If the number goes beyond what’s allowed on the free version (10k documents and 50k searches per month) you will need to upgrade to the plus version. Moreover, SearchIQ Plus is also at competitive pricing and provides unlimited indexing and searches. Want to learn more about SearchIQ and its functionality? Check out our demo site here. Website search functionality has been observed to be trending up rapidly over the last few years. Site search has a critical importance in regards to user experience and customer engagement. Internet users have become so dependable on search, that it will be almost unreasonable to forget including search functionality on your website. Several site visitors hit the search bar first without even navigating the menu. Adding an efficient onsite search box not only engages visitor and decrease bounce rate but benefits administrator in terms of conversion and analytics. The analysis of user data helps in understanding user behavior and needs, and eventually leads to an increase in conversion. Realizing the effectiveness, wordpress developers have been integrating site search option to add value to the themes. Here are the top 10 wordpress themes with remarkable site search built-in functionality. The Business Directory WordpPress theme is created by Templatic with elegant design to give your site visitors best user experience. The theme helps to create, manage and monetize a directory site for any businesses such as Car, Hotels, Restaurants, Properties, Travel Destinations and many more. There are several built-in features that make it the most powerful Directory theme including Bulk data Import/Export, Add and manage classified, Additional custom fields, Google maps, Add/Manage users, Listing rating and review, User dashboard, Email notifications, Color customizer, Fonts and Integrated PayPal payment gateway. The search engine is quite impressive and displays Autocomplete results with toggle image option. WordPress is one of the most popular and widespread CMS platforms, but it can be quite slow unless optimized properly. And having a fast website is important because page load speed decides if the visitor will hang around or move onto another site. So your website needs to be fast. Fast loading pages increase your page views, improve user experience and help with SEO. No one want to wait around for a website to load. According to Kissmetrics, “40% of people abandon a website that takes more than 3 seconds to load”. A one second delay may disappoint visitors and cause them to leave your site even before it’s gotten a chance to load properly. Even Google’s search algorithm factors site speed to rank websites, so if your site is slow, your Google ranking will fall and you may experience less traffic. A cloudliving article mentioned that every 100 ms increase in page load speed, increases Amazon’s revenue by 1%. Similarly, Gael Breton has also explained in his article on ‘AuthorityHacker’ how improving site speed results in 8.35% page view growth for their site. Moreover, the bounce rate got increased slightly. So, it is important to analyze your website first and then optimize the speed accordingly. While there are a plenty of free tools available to test your website’s speed and performance, some of the best ones are GTmetrix, Alexa Site Info, and First Site Guide. What can you do to make your site faster? In this article, we will share some simple ways to help speed up your website and improve your site’s performance. Choosing a good web host is one of the most important decisions when you are concerned about speed and performance. Hosting companies have a lot to offer from shared hosting to VPS or dedicated managed hosting, depending on your website’s requirements. Simply going for the cheapest offering, although it may be a good bargain, may come at a cost. You may experience slow site speed and frequent downtime. Shared hosting might be the least expensive option but make sure to think about server resources, you are sharing with hundreds of customers impacting the entire server performance. To invest in a good web host, choose a hosting provider with a good reputation and a server located near the geographic region of your target audience. When selecting a theme for your WordPress website, it’s better to give attention to speed optimization and go with a simpler theme. Don’t choose a theme with tons of features, that you may not need. Instead consider themes with basic functionality and use quality plugins to add features, as you need them. A poorly coded theme can be attractive and eye catching but can slow down your site. WordPress is a fast changing environment, with new updates and features being released frequently in order to keep up with trends and the needs of their users. Each new update not only offers new features but also comes with several performance improvements that make WordPress faster, more reliable and more efficient. Not updating your WordPress version may cause a slow website and may make your site vulnerable to security threats. So follow best practices to constantly update to new versions as they are released. Images add value to your content and boost user engagement. Visuals, although they enhance your site, consume bandwidth if not compressed properly. Optimizing and compressing your images should be a high priority task. In original formats, photos can be large file sizes and take long to load, and may slow down your site. Before uploading any image on your site, reduce the size of the image using lossless compression, so you don’t compromise the image quality. Fortunately, WordPress has some great plugins to optimize images. The most popular one is WPSmush, which removes unused colors from images and drastically reduces the size of your images automatically. In order to Gzip your website components you need to log in to cPanel and go to Software and Services > Optimize Website. Here, select ‘Compress All Content’ and click update settings to compress the website content. Caching is another important factor to speed up your WordPress website. Caching temporarily stores the content such as pages, posts, images and other files on your visitor’s local drive. So when requested by the same visitor, the pages are rendered much faster. The content needs to be loaded only once instead of every time the user revisits your site. Caching reduces page load time, thereby increasing the visitor time on site. WordPress has several popular caching plugins, like W3 Total Cache and WP Super Cache. These two tend to be the most popular choices. They improve the overall site performance when fully configured and can reduce the page load time from 2.4 seconds to 0.9 seconds, according to this case study by YUI Team. Using a CDN for your website can reduce the bandwidth consumption by 55%, improving the page load speed, visitor’s experience, duration of time on your site, conversion and SEO. Key CDN and Max CDN are the most popular CDN’s for your WordPress website. What is AMP? Accelerated Mobile Pages or AMP is an open-source framework to increase the loading speed of your mobile web pages. It loads your pages quicker on mobile devices, which increases the traffic and CTR. Google claimed that AMP cut down load times between 15% and 85% in initial tests. Moreover, implementing AMP can possibly offer SEO benefits. Several webmasters and marketers have observed that AMP has a huge impact on boosting your mobile search engine ranking. Optimizing your WordPress database is fairly a simple thing but has a big impact on your website speed. WordPress saves a lot of information in the database tables, and over time, the database can become fragmented. You need to clean and optimize your database by deleting the information that you probably don’t need like trashed items, unwanted revisions, unused tags, trackbacks, pingbacks, unapproved or spammed comments. You can use WP-Optimize plugin to delete this unnecessary information and clean your database, ensuring smooth running of your WordPress website. Another recommended plugin to optimize your database is WP-DB Manager which allows the scheduling of regular database optimization. If you have a lot of images and videos on your site, lazy loading is another concept that you might want to implement. Lazy loading delays the loading of objects and shows images only when a user scrolls down the page to see them. This not only speeds up your page load time, but also saves bandwidth by loading the data after user starts scrolling your page. To lazy load images, WordPress has a few different plugins like BJ Lazy Load and Rocket Lazy Load. The best plugin to lazy load your videos is Lazy Load for Videos. Auto playing video on your website’s homepage is an increasing trend but unfortunately, it consumes more bandwidth and delays loading the core elements of your page. Waiting a long time for a page to load is incredibly annoying, leads to frustration and dissatisfied visitors, which in turn increases your website’s bounce rate. So, it’s highly recommended to disable the video auto play on your site’s homepage or your landing page. Another common reason for a slow WordPress site is having too many plugins installed. Limiting the number of plugins is crucial when it comes to site speed. Besides, what is the point of installing plugins you don’t really need? The best approach is to analyze all the plugins and their impact on your website. Then keep the ones that are critical to run your website and delete the plugins that you don’t need or have a negative impact on your site. What is Hotlinking? Hotlinking is when another site displays an image on their website by directly linking to it from your website. This means when someone visits their site, they are serving images from your site, taking up your bandwidth. The request to fetch the image will go to your server, so hotlinking will consume your resources and will create additional work for your server. Blocking such links is the solution to avoid being a victim of bandwidth theft. You can disable hotlinking by simply adding the following code to your .htaccess file and updating your domain name. Whenever you switch your site theme or install a new plugin it’s worth it to regenerate your thumbnails. Most themes use different thumbnail sizes; so if your previous thumbnails for images aren’t optimized they will take up more bandwidth. You can fix this with a WordPress plugin called Regenerate Thumbnails.